On the occasion of World Environment Day, June 5, 2016, this blog post looks at one big potential or promise of the Ministry of Environment, Forests and Climate Change (MoEFCC), and its one big problem. Before going onto the theme, one clarification. This blog does not attempt any comprehensive review of the MOEFCC over the last two years. It does not attempt to critically evaluate important developments like introduction of new regulations, or the consistent dilution of many regulations and practises. This post deals with only one promising development at the MoEFCC and one serious problem. In several interviews and press releases in the last week of May 2016, on and around the occasion of completion of two years of the NDA government, ShriPrakashJavdekar, Minister of State (Ind. Charge), MoEFCC has repeatedly stated that for the next three years, his focus will be on compliance of environmental laws. (See for example, ‘Focus Over the Next Three Years will be on Compliance of Laws’: Javadekar’, Press Release of MoEFCC/PIB, 23 May 2016). This is a most welcome focus, and has the potential to transform the environment of the country. India has some good environmental laws, but compliance is pathetic. Many laws are blatantly violated, and action is rarely taken. This has created an atmosphere of impunity and an ethos where non-compliance is the norm. Compliance (rather, lack of it) is one of the biggest problems and one of the biggest challenges in the country. For example, one of the biggest menaces in the country is the ash which is produced when coal is burnt. Yet, last year (2014-15), some 82 million tons of it was just dumped in form of slurry in massive ash ponds, or in dry dumps or just discharged into rivers. (See Figures 1 and 2, for example). Figure 1: Fly ash dumped in the open near people’s houses. Odisha.Photo, Shripad Dharmadhikary, Manthan. Figure 2: Google satellite image. Fly ash dumped into Kesla River (DengurNallah) which meets the Hasdeo river. Korba, Chhattisgad. Thus, an emphasis on ensuring compliancecould be a game changer. “In arevolutionary decision, highly polluting industries were mandated to install 24×7 air/effluent monitoring devices. This has ensured constant monitoring and its tracking. “Out of 3400 polluting industrial units identified, more than 2400 industries have already installed the mechanism and the results are encouraging. If pollution norms for any parameter are exceeded continuously for more than 15 minutes, SMS alert is generated and sent to all concerned individuals/ regulatory agencies. The same document also claims that industrial pollution in the Ganga has gone done by 35%. These figures, if true, indicate not only very high levels of fulfilment of required environmental instrumentation, but also a demonstration of strong political will. Both would be welcome changes in the Indian law enforcement experience. But a given our historical legacy, the common person can be allowed a certain amount of scepticism, and hence it would be important for media and other independent organisations to confirm these levels of compliances. Supporting this will be a new legislation that is to bring in more stringent punishments for violations of environmental laws, though there are reports that it is already being diluted, even before it has gone to the cabinet. Further, there are a few points to be noted in this regard. The emphasis seems to be overwhelmingly on use of technology, and to some extent officialdom to ensure compliance. This can be very limiting. It is imperative that the common people, the affected populations and concerned citizens be also involved in the process. To this end, full transparency in the matter is an important first step. To ensure transparency, it is necessary to make available all the data from the continuous monitoring devices to the public. This can be done best by putting all the data on a publicly accessible website. SMS alerts of non-compliance can be sent to local community representatives, sarpanch apart from officials and regulators. It is critical that the locations of the monitoring points (along with their latitude-longitude coordinates) should also be made public. This will have several benefits. For one, local people will be able to clearly identify the discharge points of emissions and effluents, and hence any illegal discharges. (For example, see Figure 3,). Second, knowledge of the locations of monitoring points will allow juxtaposing all such points in area and help achieve synergies in monitoring as data from multiple points will be available in an area. Another important point is that compliance cannot be only about pollution and hence 24×7 Continuous Effluent/Emission Monitoring Systems can only be one part of ensuring compliance. There are many conditions given as a part of environmental clearances which do not pertain to pollution – for example, ensuring environmental flows in rivers below dams – and different mechanisms to ensure compliance in such cases will be needed. Figure 3: Showing a discharge from the back wall of a power plant, north of Chennai, to mangroves and wetlands. This is likely an illegal discharge point since the Environmental Clearance clearly mandates another discharge point. If the discharge locations of the plants are made public, then it would be easy to identify whether such discharges are legal or illegal. 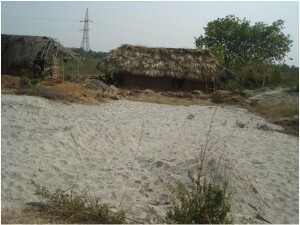 Photo: JindaSandbhor, Manthan. The most important component of any compliance mechanism remains political will. This is what the MoEFCC is actually promising when it says it will focus on compliance during the next three years. Possibly one test of this would be whether MoEFCC is able to clean up some of the most polluted areas in the country (many of them part of MoEFCC’s own designated Critically Polluted Areas) including areas like Korba, Ennore, Dhanbad, to name a few. We see the promise of compliance as one of the biggest potentials / promises of the MoEFCC. The biggest problem with the MoEFCC – and that predates this government, though it has possibly been aggravated in the tenure of the current regime – is the attitude of the MoEFCC to environment. One is that the MoEFCC has internalised the criticism that it is blocking “development”. The second is that again and again, MoEFCC betrays a lack of understanding what “environment” and “environmental protection” really means. It is ironical that the ever since the NDA government has come in, the achievement that the MoEFCC itself considers as its most significant one is that it is no longer a “road block” ministry. On the occasion of completion of two years of the government too, MoEFCC’s statements have focused on how in the last couple of years it has significantly brought down the time taken for clearance (from 600 days to 190) without compromising on environmental norms, how it has given 2000 clearances unlocking investments of Rs. 10 lakh crores, and how it is no longer called the “obstruction ministry”. Of course, it is no one’s case that the MoEFCC – or any other ministry for that matter – should become an obstruction in the process of development. But at the same time, no ministry should devalue its own agenda. The problem is that the MoEFCC has internalised the propaganda that any caring for environment means working against development, that environment protection is essentially only the formality of clearances and that protection of the environment does not need time and effort. No one will complain if a bank takes its time to evaluate a project to decide whether to finance it or not. If a large project takes several years for its engineering design to be finalised, it’s called due process. Yet, if environmental assessments take time, then it is seen as obstruction. Indeed, given the quality of current environmental impact assessments, what is needed is more diligence, and possibly more time for assessments, not less. Further, in many cases, the time taken by the environmental clearance process comes due to the bad quality of assessments. So, while by all means environmental clearances shouldbe expedited, there is a limit beyond which the process cannot be compressed. The MoEFCC now wants to reduce the time for environmental clearances (EC) to 100 days (See, for example, Interview of ShriJavdekar to Business Standard, 17 May 2016). It is not clear whether this time is measured from the date that all assessments and other procedures like public hearing and submissions of final EIA are completed. If this is the case, there is nothing new in the announcement. The EIA Notification 2006, which governs the environmental clearance process, already requires that the Expert Appraisal Committee complete its appraisal within 60 days of receiving the final EIA, and place the recommendation to the MoEFCC for final decision within next 15 days of this. The MoEFCC has to take a decision within 45 days of this. Thus, as such, even now, the decision on environmental clearance has to be taken within 120 days of the final EIA being submitted. So MoEFCC is promising to cut down all of 20 days. However, if it means that the EC will be given within 100 days of application – then it is a worrying sign. As such, impacts areas of major projects should be studied for at least one full year, to ensure baseline and other studies covering the full cycle of all seasons. There could also be cumulative impact assessments needed if more than one project is coming up in an area. Then there needs to be the public hearing, and consideration of the issues raised by public and their incorporation into the EIA. Thus, even if the entire process is carried out with full efficiency, it would need considerably more time than 100 days. Any cutting down on these times would mean a compromise on environmental norms. So the MoEFCC needs to clarify what it means exactly when it says it shall reduce the time of granting EC to 100 days. The problem is that by being so defensive about the time it takes to give environmental clearances, the MoEFCC is directly and indirectly supporting the mindset which sees environmental clearance as a mere formality and environment protection as an add-on at best. On the contrary, one expects the MoEFCC to fight fiercely to ensure that everything needed for environmental protection is given its rightful place. Another – and related – issue is that the MoEFCC view of environment does not seem to go beyond the issue of “clearances”. It needs to have a broad framework and understanding of what environmental integrity means. It needs an understanding that rivers need to flow, that forests and habitats needs to be contagious, that we can interfere and extract from the environment only to a certain extent and not more. It needs to distinguish between faux environmental protection and genuinely maintaining and restoring environmental integrity. In other words, the Minister equates road side plantations – and moreover, plantations which can be “harvested” anytime – with forests. Literally a case of missing the woods for the trees! With such skewed way of looking at environment, even the best of efforts of the Ministry will not lead to environment protection. Rather, we may end up with facades of good “environment” – like roadside plantations! There is an urgent need for the MoEFCC to internalise a more ecological and people-oriented view of what is environment, and come out defending that more strongly. Not doing so is the biggest problem and drawback to the Ministry’s efforts in the coming years. However, with the word limit of Frontline, that review had to leave out many important points. A longer of version of the review is given here. The Sardar Sarovar project (SSP) on the Narmada river- one of India’s largest dam, hydropower and irrigation project – has also been among the most controversial ones in the country. Particularly since last 30 years, protests against the project have come together in the form of a highly organised, structured, valley-wide movement under the name of Narmada Bachao Andolan, one of India’s most intense mass struggles. The NBA, while it began with the issues of displacement and rehabilitation, have questioned the very desirability of such projects, arguing powerfully that the cost from such projects far out-weigh the benefits, and that such projects are neither equitable, not sustainable. Against this background a book that claims to present research “about the direct and indirect impacts of large water recourse projects… through a comprehensive study of one of the most magnificent yet controversial multipurpose water project.. the SSP on Narmada River…” naturally elicits great interest. 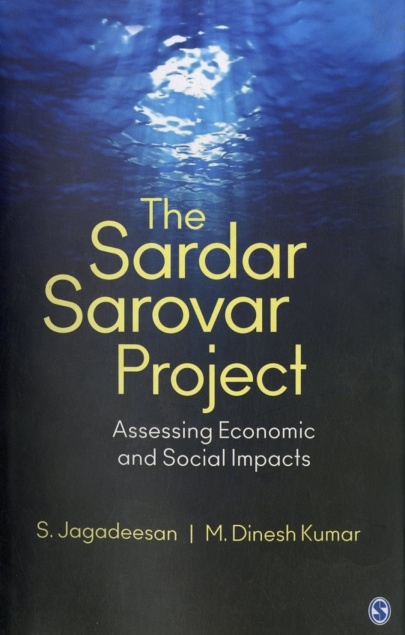 The Sardar Sarovar Project – Assessing Economic and Social Impacts, by S. Jagadeesan and M. Dinesh Kumar (Sage 2015) further raises expectations when it says that the overall objective of the research was to “undertake a comprehensive evaluation of the current and likely future impacts of the Sardar Sarovar Narmada project in Gujarat on the social, economic, and ecological/ environmental fronts…” This it does based on an “intensive empirical field-level research carried out extensively in different locations across the designated command area of SSP”. The expectations are tempered to some extent when one sees that the research which is at the core of the book has been supported by the Sardar Sarovar Narmada Nigam Limited (SSNNL), the Government of Gujarat agency that is building the dam and the project. One of the two authors of the book has also been the Managing Director of the SSNNL. Unfortunately, the book fails to do justice to its ambitious objectives and even the tempered expectations. The evaluation is not comprehensive in the economic aspects, and it barely scratches the surface in looking at the social and environmental issue. Moreover, serious methodological issues cast a shadow on several of its findings. Disappointingly, it has also side-stepped the core issues in the debate surrounding the SSP in particular and large dams in general. The authors say that in the past, assessment of irrigation projects has been done mainly in terms of the areas irrigated, whereas projects like the SSP have many more direct and indirect benefits, and they have attempted to assess the impact of the project in terms of all of these. They evaluate the following benefits of the project, namely, improving groundwater regimes in overexploited regions of Gujarat, impact of canal irrigation, impacts of drinking water supply and indirect impacts of irrigation and drinking water supply including on health, on savings in electricity for groundwater pumping and others. These are presented in four chapters of the book. Two more chapters talk about the environmental externalities of the project and impacts on displaced populations. Another chapter suggests ways for maximising future benefits of the project and minimising negative impacts. Four chapters at the beginning of the book introduce the topic, set the global context and describe the Narmada Basin and the Sardar Sarovar project and the approach and methodology of the study, including the sample size and locations of the survey. The concluding chapter summarises the book and lays out some learnings. Interestingly, the authors begin not with the benefits of irrigation but with the benefits accruing from increased groundwater recharge asserting that “One of the most significant, yet unintended, benefit of SSP is the improvement in groundwater conditions in the command are owing to recharge from irrigated fields and seepage from canal”. They compare the groundwater levels and their rise or fall in 7 districts of the command, namely Ahmedabad, Banaskatha, Baroda, Bharuch, Kheda, Mehsana and Surendranagar for periods pre and post-Narmada irrigation. The comparison in fact shows rather uneven impacts. In Kheda district, rate of groundwater rise has fallen sharply after the advent of the Narmada canals. In Ahmedabad, the rate of rise has increased for October (comparing October of pre-Narmada with October of post Narmada) but has fallen for January and May. In Mehsana in north Gujarat, where falling groundwater levels are of great concern, the rate of groundwater rise has fallen for October after the canal irrigation has started but has gone up for May and January. Similar results were seen for quality of ground water. Comparing the Total Dissolved Solids (TDS) level for pre and post-Narmada canal advent, the study finds that in Mehsana, the TDS levels began rising after the Narmada canal irrigation came in. In some of the other districts, the rates at which TDS levels were falling decreased. In some cases, these rates increased. In others words, both on quality and quantity of groundwater, the impact of canal irrigation has been mixed. Even before the Narmada canals came in, groundwater levels in several districts were rising, and TDS levels were falling. In the case of benefits of canal irrigation – either directly by canals, or by farmers lifting water from the canals using pumps – the book finds that wherever this irrigation has come, the area under irrigation went up substantially. Cropping pattern shifted towards more irrigated crops, and more remunerative crops. Moreover, crop yields went up, as did gross income for farmers. Livestock holding has slightly increased, and income from livestock has gone up. Overall, farm surplus has gone up for farmers in all districts as compared to the situation before advent of Narmada canal irrigation, as also when compared to farmers outside the command. Some of the findings are along expected lines – when canal irrigation comes in, irrigated area will go up, crops will shift to more cash crops, and crop yields will go up. What is important is the extent to which this happens, and whether benefits accrue to small or large farmers, or to both, and to what extent. Yet, the estimates of extent of these benefits have several methodological concerns, some of which the book has itself highlighted, some which it has missed. One of the most important issues is about who the beneficiaries of the project are. The survey results presented indicate that only large and very large landholders seem to have been considered. Take table 6.2 which gives change in the irrigated area in four districts before and after Narmada. The biggest change has occurred in Bharuch district, where the area irrigated per farmer has gone up from 1.27 ha to 5.11 ha. Since this is gross irrigated area, we divide it by the intensity of irrigation to get the net irrigated area. The year for which this figure is presented is not given, but we take the post-Narmada year to be around 2010, inferred from references in the book. Official data puts irrigation intensity in Bharuch district in 2006-07 at 104.71%, so to be on the conservative side, we take this as 150% for 2010, and hence the net irrigated area comes to 3.4 ha. Again, assuming conservatively that all land held is irrigated, land held or operated per farmer comes to 3.4 ha. Looking at the land operation holding statistics for Bharuch districts, one sees that 73% of the farmers operate less than 3 ha of land. This means that the sample here represents only the top 25% of land holders. Similar calculations based on table 6.3 show that the sample surveyed of farmers lifting water from canal in Bharuch district (where irrigated area per farmer went up from 7.19 ha to 25.05 ha) represents only the highest land holding farmers at top 2%, and excludes 98% of the landholders. The text also mentions that in Ahmedabad district, the average gross cropped area went up from 5.28 ha to 17.28 ha. Again, calculations show that this means that the average farmer represented in this survey was from the top 4% of landholders. In sum, it appears that in most of the high gains in irrigation benefits (and therefore also the subsequent benefits of increase in agricultural production and income) seem to be for very large landholders. Indeed, the survey itself seems to have been biased towards large farmers as a sample. Literature shows that such big canal based irrigation projects generally benefit large farmers much more. It would have been useful if the book had assessed the benefits accruing also to smaller farmers, which is the overwhelming majority in the state. An important anomaly appears in the findings when the authors say that the gross cropped area in Ahmedabad district in areas irrigated by canal lifts went up from 5.28 ha (per farmer) to 17.28 ha. However, table 6.3 gives the area irrigated by canal lifts in the district as 8.23 ha and 14.17 ha for the pre and post Narmada periods. This means that area irrigated was more than the cropped area in the pre-Narmada period! Similar anomalies are there for other cases too. Coming to the methodological issues, the authors acknowledge that in the longitudinal analysis used by the book, that is, the pre-and-post intervention scenarios approach, the “effect of changes in external environment during the time period on the impact variables has not been nullified”. In other words, there could be factors other than the irrigation which would have changed in the pre and post periods and which could have influenced the income, yields etc. but these have not been accounted for. One such factor explicitly noted by the authors is that the impact of inflation has not been considered when looking at farm incomes in the pre and post scenarios. Similarly, comparison between farmers in and outside command was done for different years, and “the market situation had changed during this period”. Apart from these aspects which have been acknowledged by the authors, there are several other issues. One is that the time periods and years when the” pre” and “post” surveys were carried out are not mentioned. It appears from the book that the comparison is done for one year in the pre-Narmada days and one year in the post-Narmada period. Such a one year to one year comparison is fraught with risks of high errors, particularly in exceptional cases like one of the end years being a drought year. The numbers – of increase in yields and incomes, for example, should therefore be taken only as indicative, and sometimes even the trends may be wrongly shown. The survey should have actually captured data for a few years in the pre-Narmada period and few years in the post-Narmada period. At the least, the authors should have also indicated the years and period of surveys, and brought out the characteristic features – like rainfall, for example – of these years. Another aspect is that the survey that the authors have carried out is a sample survey. The sample size has been given in the chapter on methodology. However, the total population from which this sample s drawn is not given. Thus, it is difficult to judge whether the sample size is adequate. For example, the three categories covering irrigated areas – canal irrigation, irrigation from canal with lifts, and well irrigators in canal command, have a total sample size of 726 farmers, spread over 7 districts. However, the total area commanded, and the total number of farmers who are receiving these benefits (which would be the total population the sample is supposed to represent) have not been given. Elsewhere, the book mentions that the project is irrigating about 600,000 m ha. This could represent several lakh farmers depending upon the average land operated. Given this, a sample of 700 seems inadequate to allow any generalisation of the findings. At the least, the authors should have presented the population sizes along with the sample sizes, and presented their justification for sample size that they have chosen. Similarly, authors describe their survey sample as “multistage, stratified, random” sample. However, the stages, clustering and strata are not given in any meaningful detail. The authors only talk about covering all districts and agro-climatic zones, and head and tail reaches of canals. There is no mention of stratification as per land-holding, which is one of the important determinants of how much the farmer benefits from such projects, as well as is one of the crucial measures of the equity in distribution of benefits. Given that the USP of the book is its “intensive and extensive empirical field-level research” , these issues at the least / at best highlight the inadequacy of the chapter on methodology which should have dealt with all these aspects in detail, and at worst raise serious questions on the methodology and therefore on the findings. Another aspect is the book has not given the increase in areas irrigated as a whole for each of the districts, but rather only for the sample farmers that they have surveyed. Thus, it is difficult to see the overall impact of the project till now. The book’s survey also throws up some important trends which have long term implications which the authors have not analysed. It shows a shift to high input, high risk, market-oriented cropping in the SSP command, a phenomenon seen in many other parts of the country too where such irrigation has come in. In particular, the survey shows that while the crop yields and gross income has gone up, the costs of inputs and cost of cultivation has also gone up sharply in most cases. This is manifested in the net income actually going down for several crops after the advent of irrigation. For example, the net income per hectare of paddy has gone down by Rs 14,498 in Narmada district and Rs. 19000 in Panchamahal district after irrigation from Narmada has started. It is true that as of now, for most crops, the increase in yields and better prices in the market outweigh the increase in cost of cultivation, but experience in other parts of the country – for example in Punjab and Haryana – has shown that this gap would narrow in the coming years and more and more crops could become un-remunerative for the farmers, even as the yields would go up. “One of the land mark impacts of the Narmada project has been on the improved access to drinking water,” the authors assert. In fact, the drinking water benefits – the project is to supply municipal water to more than 9000 village and 125 towns – have an interesting history. This was not a component of the project at all, except to make available the waters for the municipal authorities to pick up and use. But as the project came under increasing criticism, the drinking water supply part was added, with the proposed number of beneficiary villages and towns increasing every few years. What is equally important, the project, whose main justification was to provide waters to the drought prone areas of Saurashtra and Kutch, was (is) actually providing very little to these areas in terms of irrigation. When this became an issue, the state responded by adding the drinking water component with promise to provide all villages, towns and cities in Saurashtra and Kutch with municipal waters from the project. Hence, this component has high political importance. One of the most important impacts was that most households expressed that there was improvement in the water quality post Narmada, that the water was soft. The authors however do not analyse the reasons about this uneven performance of the water supply scheme. Could it be that diversions over and above those in the original plans to politically and economically powerful centres like industries and cities like Baroda and Ahmedabad be a reason? Or that a system of water supply to thousands of decentralised centres from a centralised source, transferring water from several hundred kilometres has some inherent limitations and problems? Such analysis is critical to understand the efficiency and efficacy of the drinking water system for SSP and whether it is an optimal way to address the domestic water needs. The section on environmental externalities is very inadequate as it does not deal with most of the environmental problems. Only a few random issues are addressed. The authors are optimistic that the problems of waterlogging will not occur in the SSP area, as there are extensive groundwater withdrawals in the command. However, this is not a correct reasoning, for the real dangers of waterlogging will come within areas underlain with saline soils and water, as the experience of Punjab and Haryana has shown. The most astonishing argument made by the authors is about the “ecological benefits accrued through the release of water into environmentally stressed rivers of Gujarat” – one example of which is the famous Sabarmati river front project. They argue that rising incomes increase people’s demands for environmental services, and as Gujarat’s income has grown, so have the need for these, including the “desire to re-establish the flow regimes in the rivers…whose natural flows have been drastically altered due to diversions or impoundments…Government of Gujarat took a major initiative to release a part of unutilised flow from the Sardar Sarovar reservoir into these rivers to improve their ecological health ….” In other words, what they argue is that people of Gujarat have destroyed their own rivers through diversions and dams, but now are using their wealth to dam and divert the Narmada to make their rivers ecologically healthy. This is not only a highly distorted understanding of what ecological health should mean, but it is also a justification for the rich grabbing resources. The chapter on socio-economic impacts on displaced population lists how many oustees have been displaced and settled, and how most of them have got 5 acres of land. First, the study looks only at resettlement in Gujarat and not M.P. and Maharashtra – which have the lion’s share of displaced populations. Moreover, the rather straightforward and almost algebraic description of displacement glosses over the massive suffering that thousands of people have faced for decades, and continue to do so and the fact that while there has been some improvement in resettlement policy, it has come mainly because of the intense, relentless and arduous struggles being waged by the oustees, and not through any goodwill of the Government. It shows none of the problems that even the resettled people continue to face. However, we can still get some indications from some discussions in the chapter. For example, the authors mention that only 10% of the gross cropped area in the resettlement sites was under irrigation – even though the oustees are supposed to get irrigated land in the command. The authors also mention that 80 out of 126 resettlement sites are in the command and hence are “likely to receive Narmada waters”. No time is mentioned. Also, this means 46 sites are out of the command. At another place, where coping strategies during droughts and stress are described, the authors mention that in their original villages, oustees had their indigenous institutions of mutual support, and the natural capital like forest produce, meat and fish. In the resettlement sites their new coping strategies include “outmigration …in search of casual work… reduction in use of purchased inputs…”. However , the chapter ends with an acknowledgement that this had been a weak area for SSP. The book has two major shortcomings. First, for a book that sets out to do a comprehensive economic assessment, it strangely has left one side of the balance sheet – the costs – completely blank. In the entire study, there is little about the costs that have been paid or need to be paid to obtain the benefits described. Some of these costs are the overarching and broader huge financial, social and environmental costs of the project, which have not been looked at by the book. For example, the book , the mentions only in passing the total financial cost of the project, expected to be more than Rs. 50,000 crores at least, just for the irrigation component. At the same time, some of the internal costs – which are part and parcel of the benefit being studied, have also been ignored. For example, the authors have counted huge savings in electricity costs of pumping ground water as one of the important benefits. These saving have accrued because canal waters have seeped into the ground and led to rise in groundwater levels. However, they have ignored the fact that in large parts of the command, particularly in the entire Saurashtra and Kutch, water has to be lifted and pumped up. Both the Kutch and Saurashtra branch canals will get water from the main canal only through massive pumps. This energy consumption is not counted. Similarly, the rise in groundwater levels due to seepage from canals is considered, as mentioned earlier, as one of the most significant and unintended benefit. However, this ignores the fact that irrigation from canal waters is a zero sum game. If some water seeps out, this means that another part of the canal command will not get that water. It should be kept in mind that SSP canal command has been designed assuming a very high irrigation efficiency of 60%, thus assuming few losses. But this “cost” of the enhanced ground water recharge has not been taken into account, nor the fact that this groundwater recharge will be a transient benefit, till other parts of command claim their right. The important point about costs not being addressed is that the criticism about SSP has essentially about benefits for whom, and at what costs, and making realistic estimates of benefits. In other words, the a core of the debate has been about “net cost benefit” as is also recognised by the blurb on the back cover of the book. Yet, there is no attempt to even look at these costs. It is ironic that at one place, the authors state how “continuous increase in groundwater irrigation [in Gujarat] came with a huge social, economic and environmental costs…”, and therefore justify Narmada waters coming into this area to replace or supplement ground water irrigation, but forget that Narmada waters can come to the area only with similar huge social, economic and environmental costs. The second major shortcoming is that the study has not addressed the broader issues that have been raised in the protests and challenges against the project. One such issue is the fact that the irrigation benefits from the project are to accrue mainly to the water rich areas of Gujarat, and the drought prone areas, particularly Saurashtra and Kutch are to get very small shares. The authors do not touch this issue, even though they note that “areas which now receive the water from Narmada canals by gravity mostly fall in the high rainfall areas” and also argue that the better economic gains can be made if the Narmada waters are used in the water scarce areas. Another issue is about the time that such projects take to deliver benefits, which is also another form of cost. While the protests and struggles are (wrongfully) blamed for the delay in the project, it is now almost 15 years since 2000, when the Supreme Court gave the final go ahead to the project. Yet, the authors note that only one third of the command is still irrigated (and that too the high rainfall areas mainly) but do not raise any issues about this. Similarly, while at one place the authors lament about how Kutch has been thirsty for nearly two centuries they do not question why this has been so and whether there has been no other way to address the drinking water needs of the district for 20 decades, when these needs constitute a small quantity of water compared to irrigation needs, and when the district itself has been growing water intensive crops like sugarcane. The authors do not even question that even if Kutch had to be given waters from another dam far away, why was it not given water from the Mahi Kadana dam, which was completed as far back as 1979? Ironically, the drinking water component analysed by the authors, and what is now called the Narmada canal based water supply project actually has also waters from the Mahi project. So why could this not have been done in 1979 itself and cut Kutch’s wait by 30 years? The other and equally important broader issue of the debate is whether water needs of the regions can be met by any other means, and how these means compare with the SSP in terms of the balance of benefits and costs – in other words, the issue of alternatives. The book makes a passing, and incorrect reference that “those who critiqued dam building never mooted such convincing alternatives to the Sardar Sarovar”. In fact, one of the important grounds for challenging the SSP was that there were much better alternatives. It is interesting that another recent study (Shah et al 2009)notes that “Canal-irrigated South and Central Gujarat should have led Gujarat’s agricultural rally. Instead it is dry Saurashtra and Kachchh, and North Gujarat that have been at the forefront. These could not have performed so well but for the improved availability of groundwater for irrigation. Arguably, mass-based water harvesting and farm power reforms have helped energise Gujarat’s agriculture.” The study also shows how in the Gujarat decentralised water harvesting structures have served by far the largest acreage and have had the highest water productivity. The book under review does not even ask this question about whether any alternatives are there and if so, how they fare vis-à-vis SSP. All in all, the book presents some empirical research on the impacts of irrigation and drinking water from Narmada in various parts of Gujarat, and this research shows mixed results. Some benefits have been achieved, at some places, and at others the impact has been lesser. Methodological issues also bring in significant margins of errors to several of these results. However, this effort falls far short of any “comprehensive evaluation” of the SSP, an objective that the book has set out for itself. This is partly because it does not address or include any costs, thus evading completely the “net cost benefit” issue. 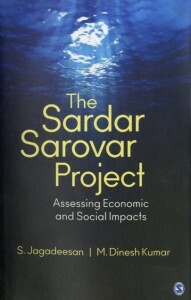 Given this, whatever benefits are presented for Narmada project, cannot be used to justify such projects as the chosen or optimal interventions, simply because the book has refrained from touching the two aspects necessary to reach such a conclusion – the cost-benefit balance, including the distribution of the costs and benefits in terms of who benefits and who pays the costs, and the question about whether similar benefits can be obtained by any other means which offer a better cost-benefit balance, that is, the question of alternatives. In refraining from addressing these two issues, and also the set of broader issues that are at the heart of the struggle against the SSP, the book has limited its own scope to a fairly narrow one, one that then also limits its utility in terms of any conclusions about the need, desirability and viability of large scale dam projects like the SSP. It also falls far short of its own objectives, that of a “comprehensive evaluation” of the SSP. For that, we have to wait another research, another publication. I am extremely grateful to Himanshu Thakkar, Himanshu Upadhyaya, K.J. Joy, Rohit Prajapati and Nandini Oza for their comments on the draft of this review. I am also grateful to Ann Josey for insights into some methodological aspects. Needless to add, I alone am responsible for the contents of the review. All quotes are from the book, unless indicated otherwise.